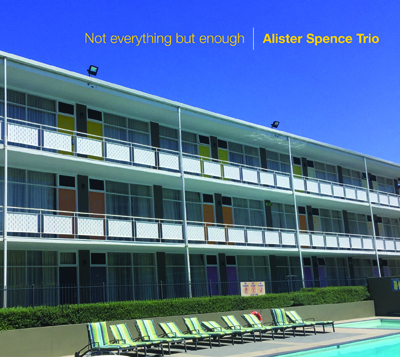 The Australian, Sydney-based Alister Spence Trio - pianist Spence, double bass player Lloyd Swanton, known from The Necks, and drummer Toby Hall, has been working together for twenty years and still eager to evolve and explore new territories. Spence worked recently with pianist-composer Satoko Fujii and her Japanese Orchestras in Tokyo, Nagoya and Kobe and recorded before with American pianist Myra Melford and Scottish sax player Raymond MacDonald. Swanton’s impressive suite Ambon, drawing from his uncle’s secret diary kept whilst a prisoner of war in World War II, was released in 2015 (Bugle Records). Swanton also leads his own group, The Catholics, where Hall plays the drums. Hall has also collaborated with pianist Mike Nock. 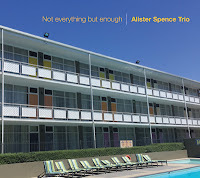 The double-album Not Everything But Enough, the seventh release of the trio, offers two totally different incarnations of the Alister Spence Trio. It was recorded in two sessions in 2014 and 2016. The first disc summarizes the trio work so far and features six compositions of Spence and one trio improvisation, recorded in October 2016. The second disc suggests new territories to explore and expand in the future and features seven solo piano improvisations of Spence from the same recording session plus 14 guided trio improvisations recorded in December 2014. Both discs emphasize the trio imaginative improvisational skills and its constant need to experiment with new sounds and dynamics. The first disc features the trio diverse dynamics, alternating organically between the written segments and the improvised abstractions. The usage of samples by Spence and subtle percussive sounds by Hall, mainly glockenspiel and bells, on the title-piece enhances the tension building of the cinematic, minimalist groove. “As True” deepens the mysterious, minimalist vein where Spence piano hovers over the light pulse. “In a Good World” and “Peculiar Orbit” highlight the strong, multi-layered rhythmic sensibility of a trio. “Camphan Frog Song” suggests an enigmatic textual statis, closer to The Necks dynamics, stressed by the bow work of Swanton and the glockenspiel of Hall. The reserved and lyrical “Time and Place” sound as coming from ECM catalogue of impressionist Nordic pianists. The last piece on this disc,“Hopeful”, resumes the cinematic, minimalist groove. The second disc 21 short “Room”-numbered improvisations experiment with demanding dynamics, all attempt to suggest new means of interplay outside the trio comfort zone. These improvisations also incorporate new sonic possibilities to the trio language, affected by Spence playing on the prepared piano and Hall on the glockenspiel. These brief improvisations investigate dark and abstract atmospheres, ambient, gamelan-like pulses, fleeting, ethereal melodies, sparse, fractured rhythmic patterns, weird-sounding drones and intense, chaotic free-improvisations.